A special silver coin released today honours the May 19 nuptials of Prince Harry and Meghan Markle. The Royal Canadian Mint has caught royal wedding fever. In honour of the wedding of Prince Harry and Meghan Markle, the mint unveiled a special $20 silver commemorative coin on Wednesday at 10 a.m. ET. 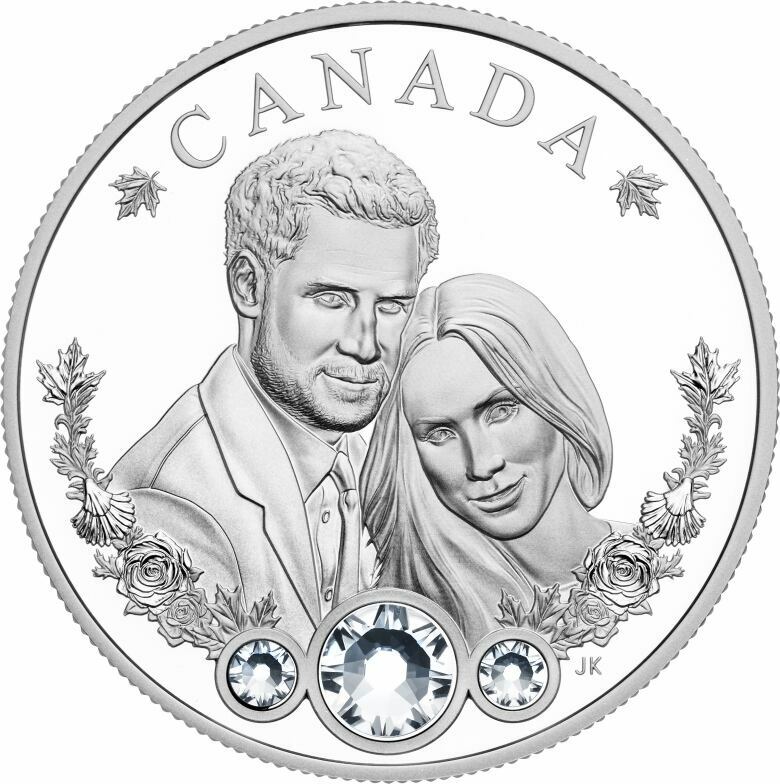 The coin, designed by Canadian artist Joel Kimmel, features the smiling couple as well as three Swarovski crystals and a border of roses, maple leaves and scallop shells. "It has a very elegant look to it. It seems very appropriate for a wedding," Kimmel told CBC News. 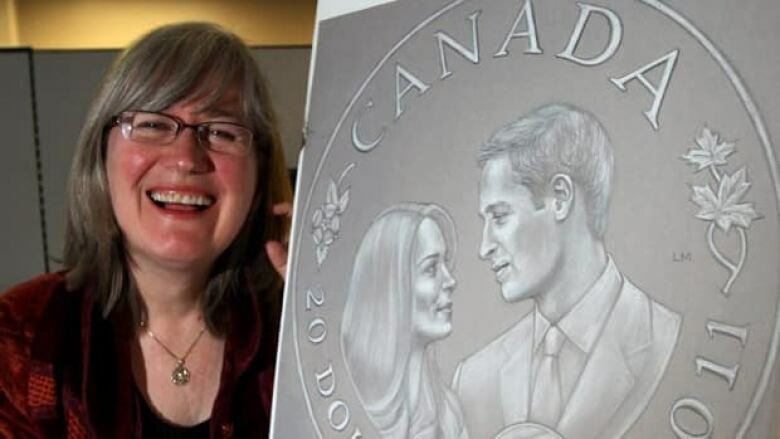 Sandra Hanington, president of the Royal Canadian Mint, said on Wednesday that the coin represented a "heartfelt symbol of Canadians — all Canadians — warmest wishes." 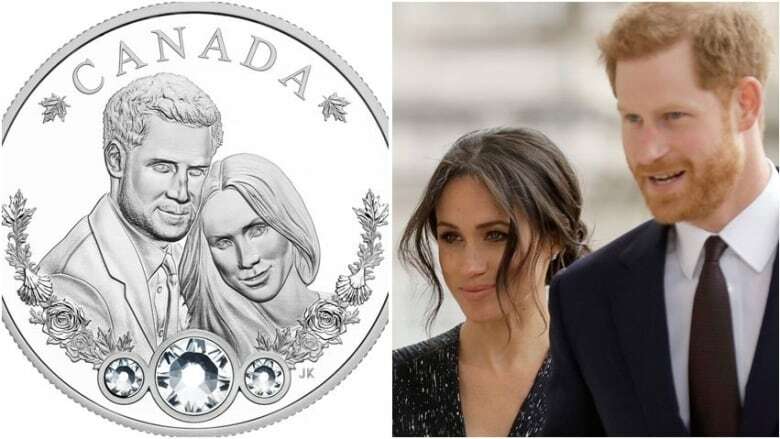 The coin design was revealed at Toronto's Centre for Addiction and Mental Health, in honour of Prince Harry's advocacy for mental health issues. Harry had toured CAMH in fall 2017, 26 years after his late mother Diana, the former Princess of Wales, visited in 1991. In his honour, Hanington said the mint had decided to make a $25,000 donation to the CAMH Foundation. After Hanington spoke, CAMH Foundation president Deborah Gillis shared fond memories of Harry's time at the hospital. "He listened attentively to patients who sought treatment at CAMH. He showed that they were important and valued," she said. The mint also created coins for Harry's brother, Prince William, for his 2011 wedding to Kate Middleton. One of the two coins they designed, a $20 silver coin decorated with a sapphire-coloured crystal, features an engraving of William and Kate looking lovingly into each other's eyes. Hungry for more royal wedding updates? Sign up for The Royal Fascinator, CBC's royal wedding newsletter, by clicking here.